When a doctor prescribes a medicine, the doctor considers not just the patient’s malady, but specifically also the patient’s past case history. Sometimes, if the patient has some allergy or some other complication from the past, then a medicine can have a counterproductive effect. Spiritual wisdom, of for that matter any kind of wisdom, is often compared to a medicine for us, souls who are currently deluded by various kinds of worldly illusions. When we start sharing wisdom with others, we take on the role of spiritual doctors who are meant to provide the wisdom-nuggets that can have a therapeutic effect for our audience. While prescribing thus, we absolutely need to take the responsibility to know the particular sensitivities of our audience so that they don’t get unnecessarily alienated by peripheral points that are make them unreceptive to core wisdom. 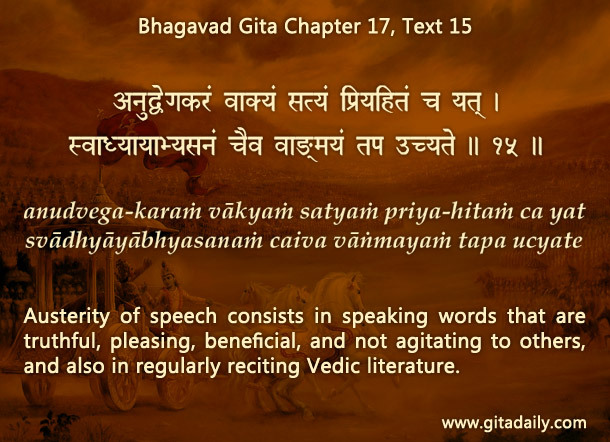 Pertinently, the Bhagavad-gita (17.15) recommends that we practice austerity of speech which begins with speaking in a way that doesn’t agitate people’s minds. Certainly, sometimes truth is unpalatable, just as some medicines are bitter. But just as everything bitter is not medicine, so too every unpalatable word is not truth. Just as a patient often needs to be sweetly and gently explained the potency and the necessity of a bitter medicine, similarly, we need to speak appropriately to create the necessary foundation of trust and intellectual conviction in our audience by which they will become ready to accept the unpalatable words that we may later speak. In communication, we need to consider not just the correctness of our speech, but also its appropriateness; when we give due attention to the context in which we are speaking, our words will be much more effective in bringing about the desired transformation.